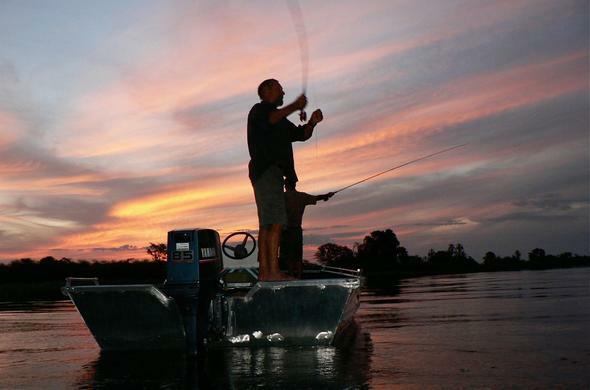 A journey from the Botswana Journals of Leigh Kemp into to the heart of the Okavango Delta's rich game fishing region. The clouds of the new season reflected on the water, rippling as the hippo splashed and grunted their disapproval at my presence. A herd of more than three hundred buffalo were grazing and moving slowly toward the river not more than fifty meters from where I was standing.I was standing at the edge of Ntsarelangwan Lagoon which was hidden from the Boro channel by the trees of a small island. At times during the winter months the lagoon is part of a greater body of water but during the summer months it is a separate entity, a beautiful paradise hidden from view by the trees of surrounding islands.A fish eagle shouted from beyond the Boro and then there was silence, the beautiful silence of absolute peace. I watched an elephant amble slowly to the water on the opposite side of the pool, paying me no heed. The season has moved on, as a lover passing with a promise to return, leaving memories and a yearning. Do not mourn her passing but learn to love the new season for she is beautiful.